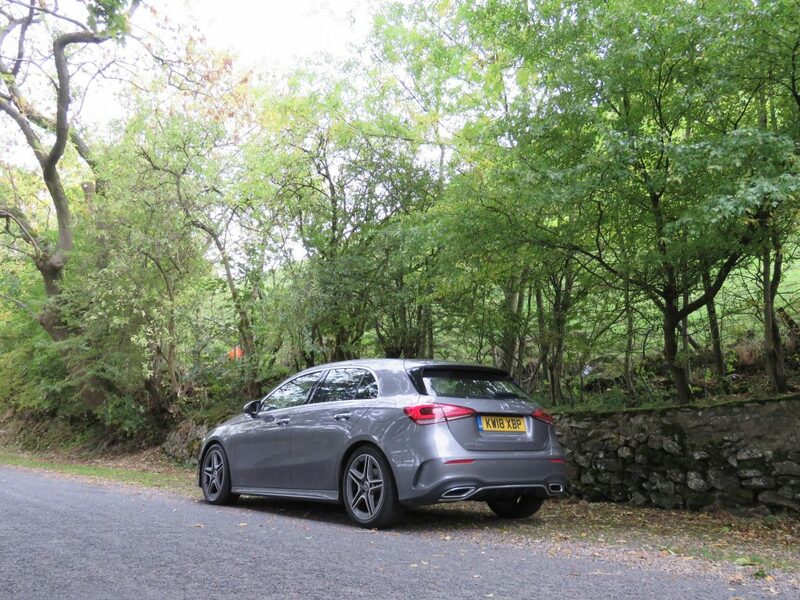 THE Mercedes Benz A-Class is a best-seller in Europe – and especially here in the UK where Mercedes sell more A-Class models than any other; Which is no surprise really as it’s the cheapest way to get into Mercedes-Benz ownership and MB has always been an aspirational brand. The trouble with the old model A-Class was that it didn’t actually feel very premium when you were sat in it. It felt a little cramped and some of the materials used didn’t feel very special. Another gripe was the boot opening which was an awkward shape and left many people frustrated when trying to load wider objects in. 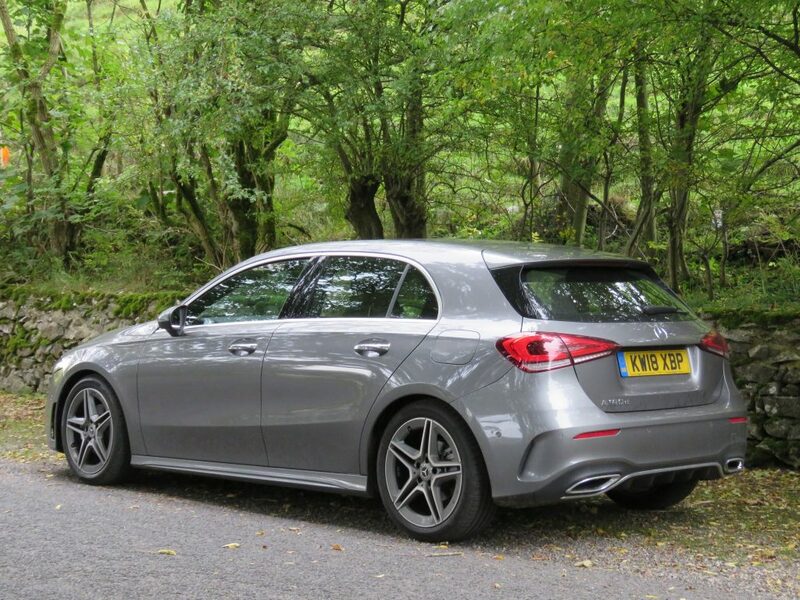 However, all these issues have now been addressed and the new, 5-door only, A-Class is not only easier to live with but looks better than ever from the outside too. 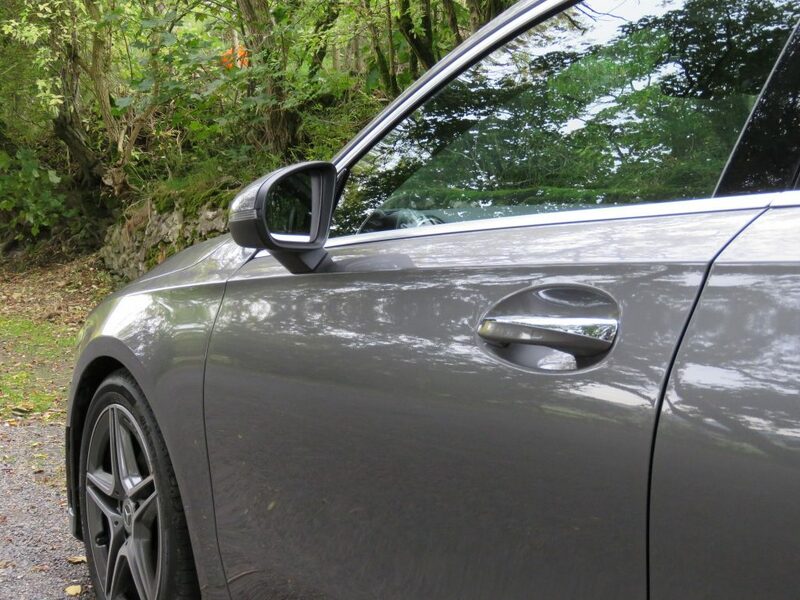 The brand-spanking new Saloon version is also well-worth a look. The new A-Class is much sleeker and less fussy-looking thanks to less creases in the bodywork. 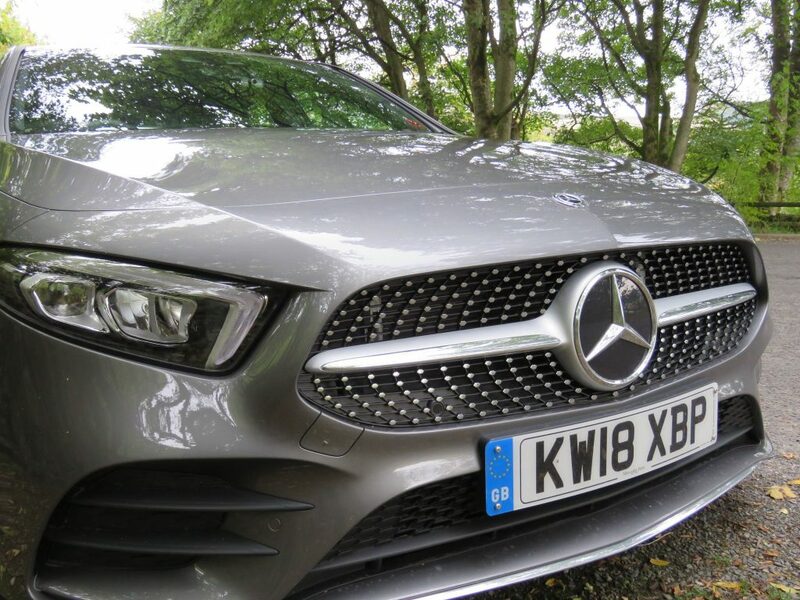 The large, open grille at the front is bound by narrow headlights that make the A-Class look a little meaner; more purposeful. It’s slightly longer and wider than what has gone before but is around 20kg lighter, and comes with new, more efficient, petrol and diesel engines which makes for lower carbon emissions and significant fuel savings. All good then? 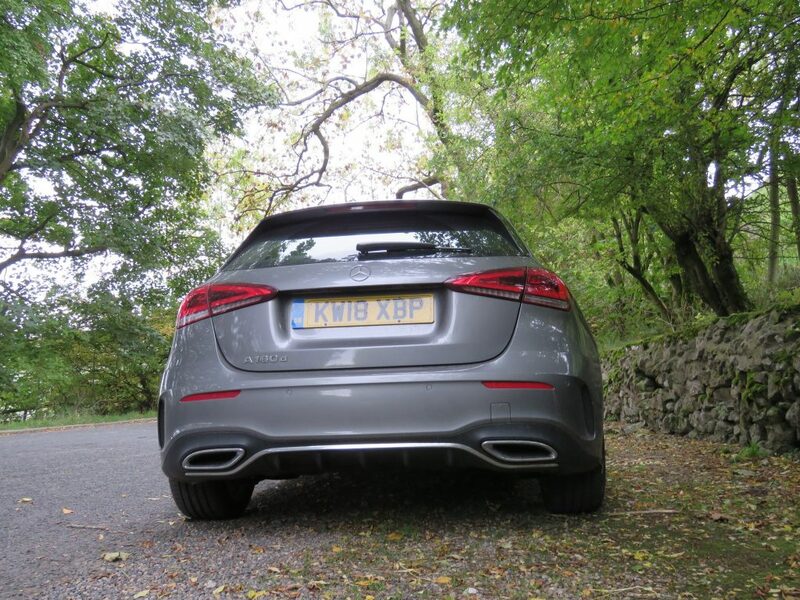 Well, so far yes; I think it’s a good-looking hatchback that stands out from the likes of the Audi A3 and the BMW 1-Series enough for you to sit up and take note – but where it really starts to pull ahead of the competition is on the inside. It’s utterly brilliant. 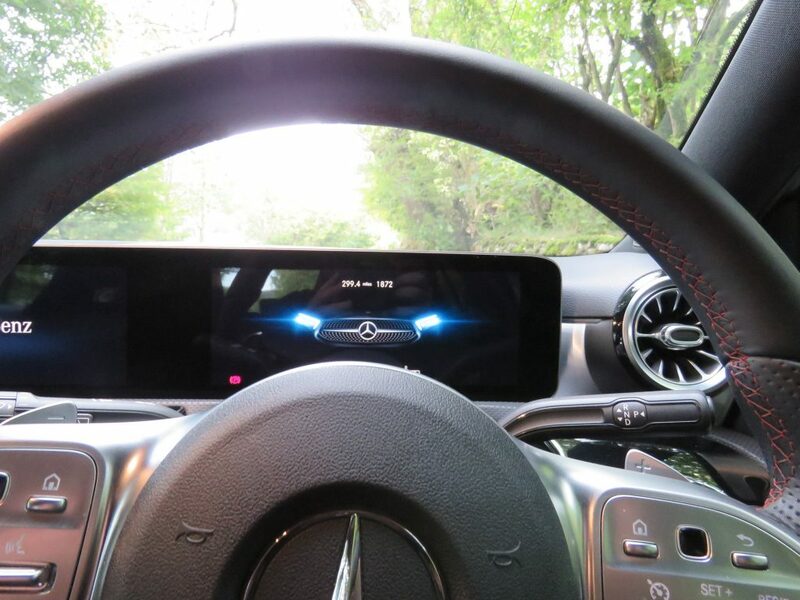 There is not only more space in the new Mercedes A-Class, there is more space-age. The twin 10in. 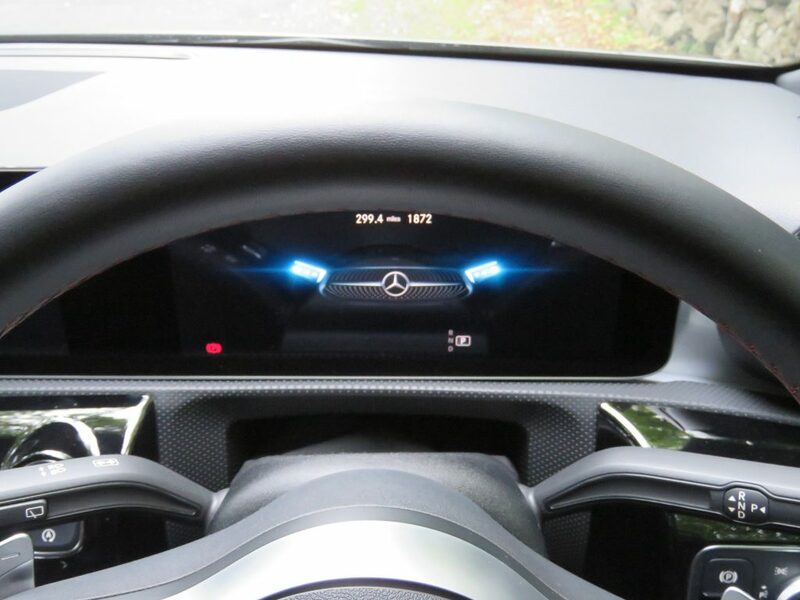 digital screens sweep across the top of the dash quite dramatically making the competition look decidedly dated. On their own they could look like a desperate attempt to impress, but the rest of the dash – with its beautifully-lit, circular, turbo-like air-vents and stepped dash-top with textured inlay looks magnificent. 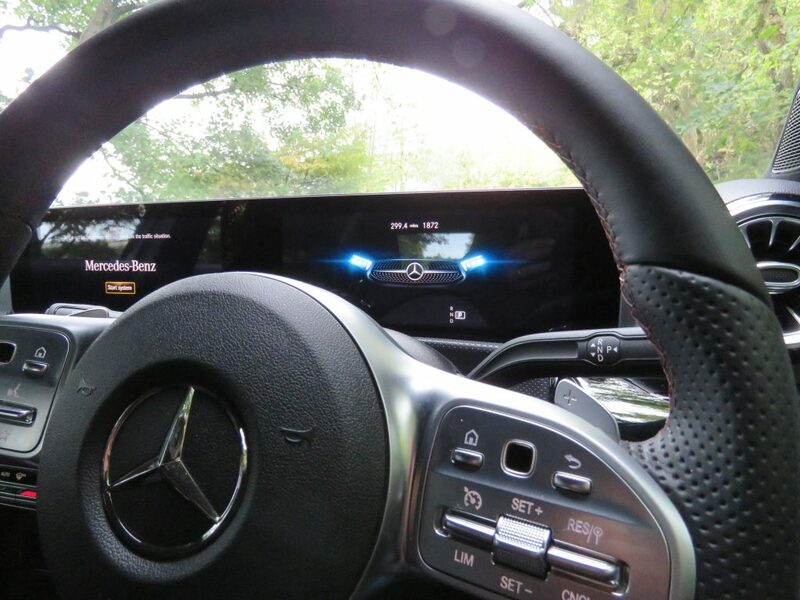 Many have compared the experience to sitting behind the wheel of the Mercedes-Benz S-Class – which is no surprise as the multi-function steering wheel is lifted straight from that luxury saloon. But this is an entry-level car and still Mercedes are providing an interior that feels many magnitudes of opulence above the competition and to top it all they’re also providing their latest “human centred interface” in the shape of the new MBUX (Mercedes Benz User Experience) system which allows you to use natural language to control many functions of the car (including Sat Nav) by simply saying “Hey, Mercedes” followed by your instruction such as: “take me to the nearest petrol station”, or “turn the temperature down 2 degrees”. It’s all very impressive but before we get carried away I should say that some of the more impressive items come at a cost. 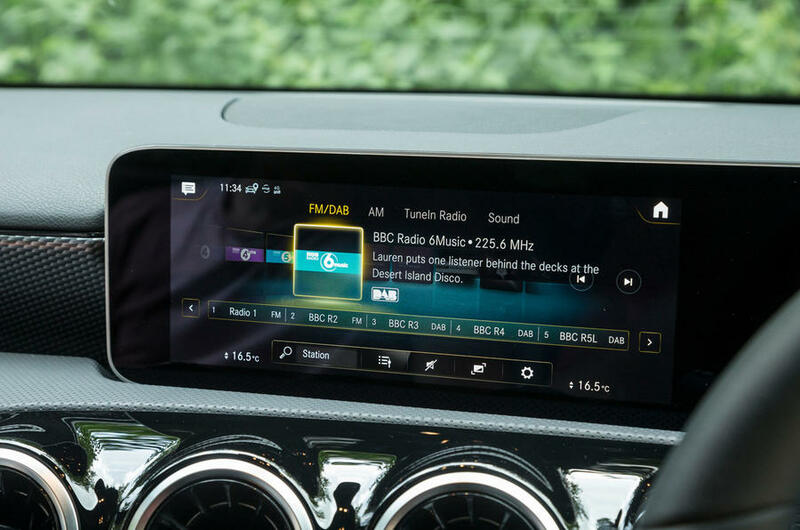 The Digital Instrument Display comes standard as a 7in unit, as does the Digital Media Display so while they look pretty good they aren’t nearly as impressive as upgrading to the 10in versions which means you’ll be paying £3,595 for the Premium plus package. For that you’ll also gain the likes of an electrically adjustable driver’s seat with memory, panoramic sliding sunroof, MBUX multimedia system, adaptive Highbeam Assist Plus, heated front seats, 64-colour ambient lighting, Keyless-Go and a Parking Package. Prices start at just £23,075 OTR for the A 180 SE petrol which sports a 1.3, 4-cylinder engine with 136 bhp. 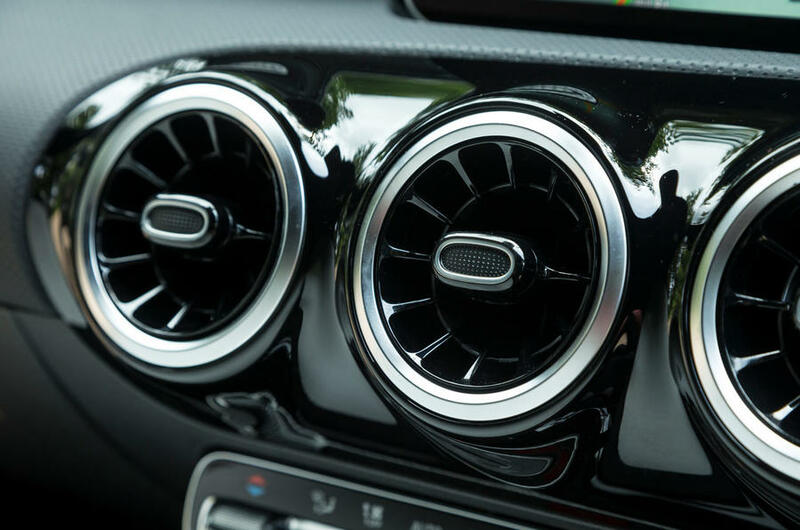 Trim level are the familiar SE, Sport and AMG-Line with the petrol-driven A 180 and A200 being available with either a 6-speed manual or 7-speed Auto transmission. 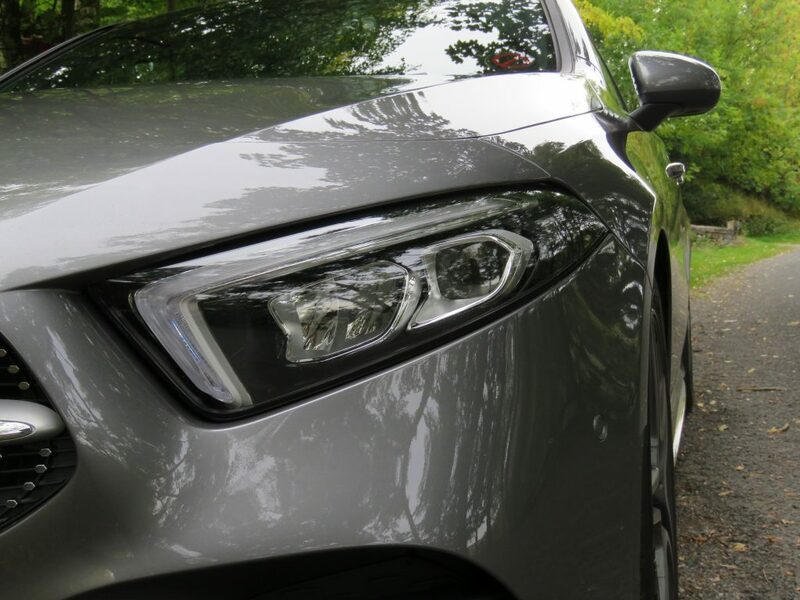 The A 220 (2.0 litre, 190 bhp) and A 250 (224 bhp) are only available with a 7-speed auto box while the diesel variants come with a 7-speed auto box on the A 180d (1.5 litre, 116 bhp) or 8-speed auto transmission on the A 200d (2.0 litre, 150 bhp) and A 220d (190 bhp). 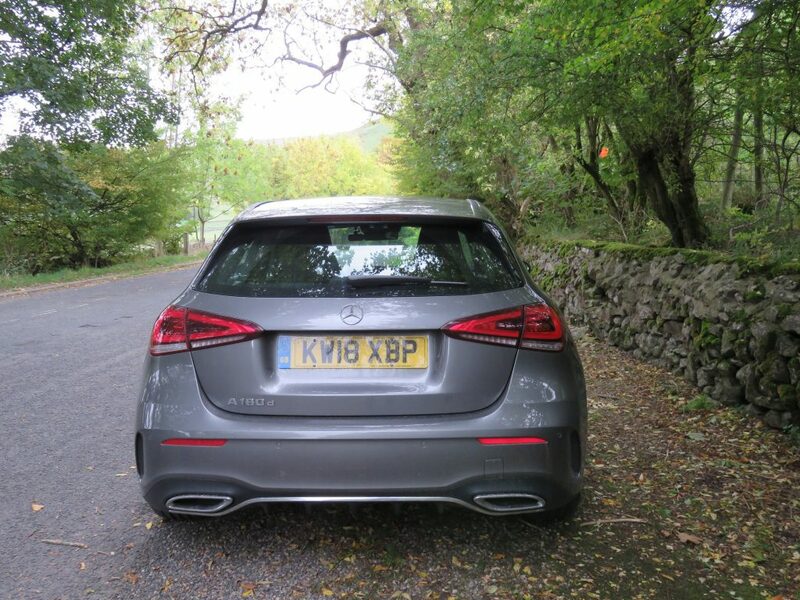 There’s also the stonkingly quick Mercedes-AMG 35 4MATIC which boasts 306 bhp and all-wheel-drive (£35,580 OTR). Whichever variant you choose you’ll be getting one of the best interiors in class and some cutting-edge tech. The MBUX system is standard across the range. The entry-level SE comes with 16in alloys, Active Brake Assist, Active Lane Keeping Assist and Speed Limit Assist as well as those twin 7in displays, Cruise Control, Air Con, DAB radio, Sat Nav, Keyless-Go and ARTICO man-made leather with Bertrix fabric. 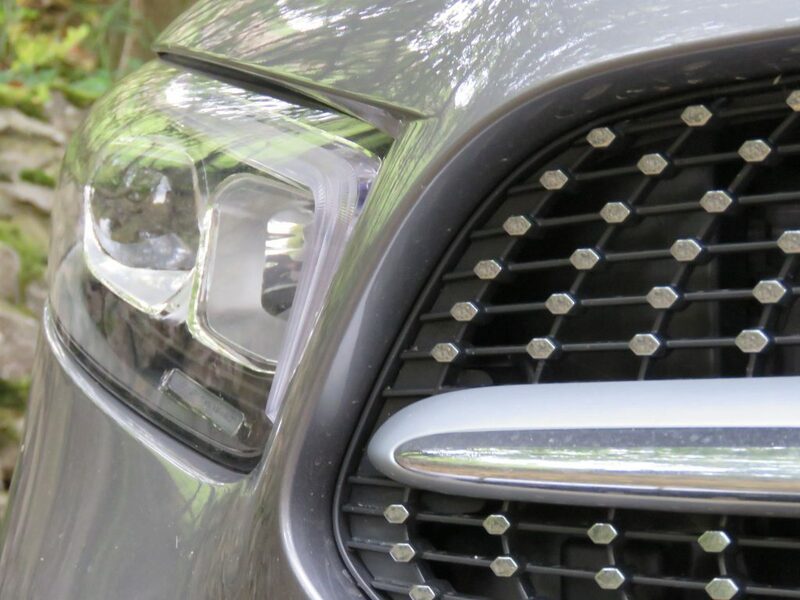 Sport trim adds 17in alloys, LED headlamps, dual-zone climate and some premium styling touches while AMG-Line models gain 18in wheels, diamond radiator grille with chrome pins, sports seats, 3-spoke multi-function sports wheel in nappa leather and an AMG bodystyling kit which consists of front apron with front splitter in chrome, side sill panels and rear apron with chrome trim and visible exhaust tailpipes. 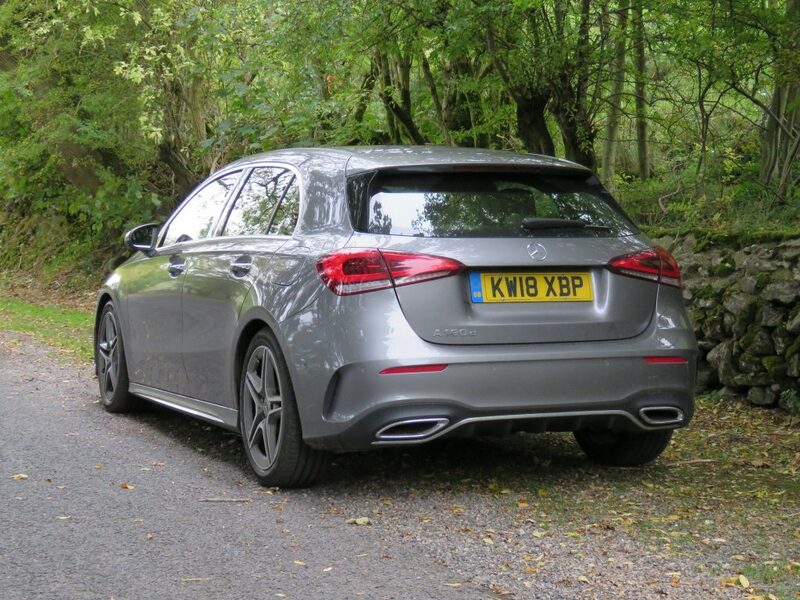 I’ve been driving an A 180d AMG-Line variant with the Premium Plus package added and in the week I had it I travelled a couple of hundred miles – mainly cross-country – with no complaints from myself or my passengers when it came to comfort and refinement. Rear passengers found leg and headroom was good although travelling with 3-up in the back would be a squeeze. Just like it would be in rivals. The flat-bottomed boot now has a squarer opening to ease loading and unloading and the rear seats split 40-20-40 for superb flexibility. The boot space isn’t quite up to BMW 1-Series or Audi A3 size but I used it quite a lot and had no problems fitting in two medium sized suitcases with room to spare. 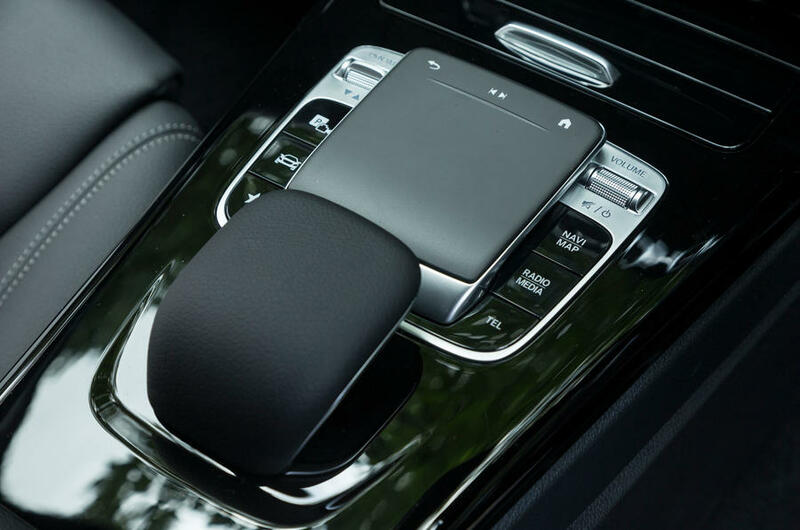 The voice-activated controls worked magnificently but the novelty soon wore-off and I found myself using either the responsive touch-screen or the handy and intuitive track pad located between the seats. 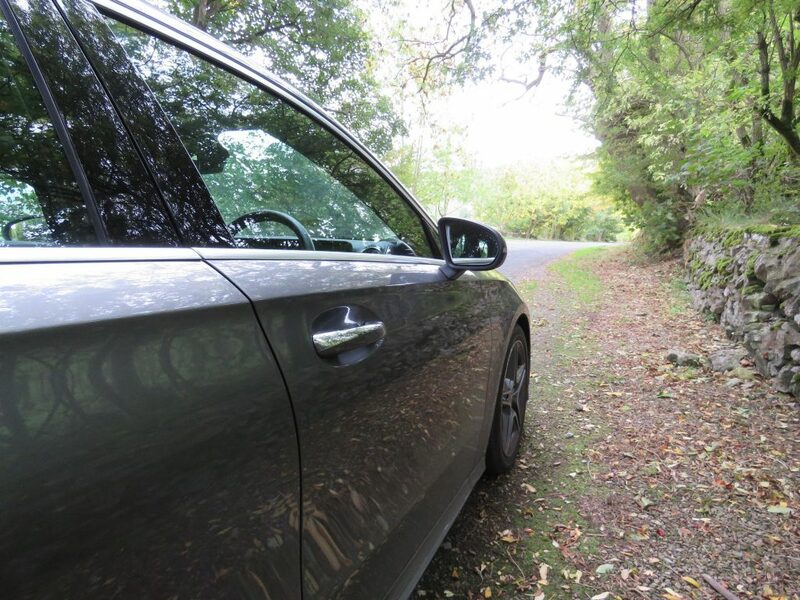 The 1.5 diesel pulls strongly and although it never feels sporty you can certainly trap-along at a fare rate. 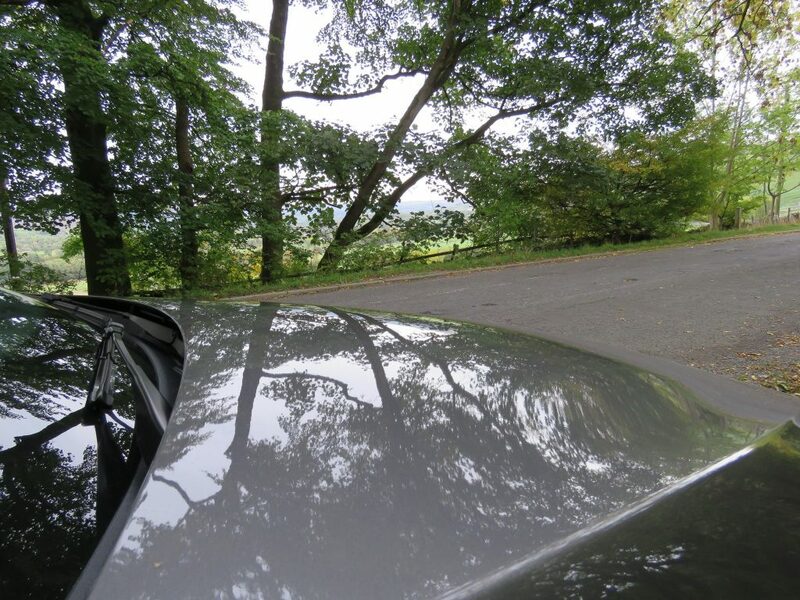 On the motorway it felt as refined as any 2.0-litre diesel I’ve ever driven with virtually no wind-noise at all. 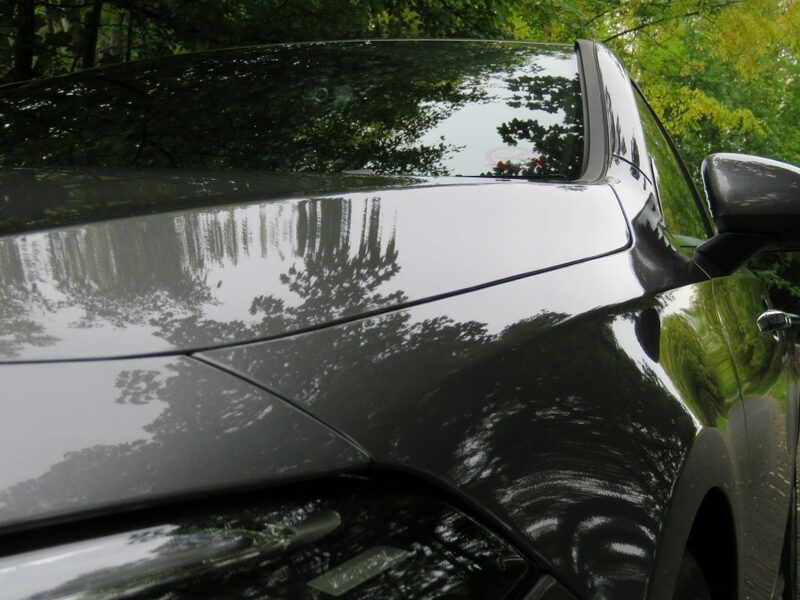 The 7-speed auto box handled every situation effortlessly and while it’s a doddle to drive around town I found the steering lacked feel although it did load-up at higher speeds. 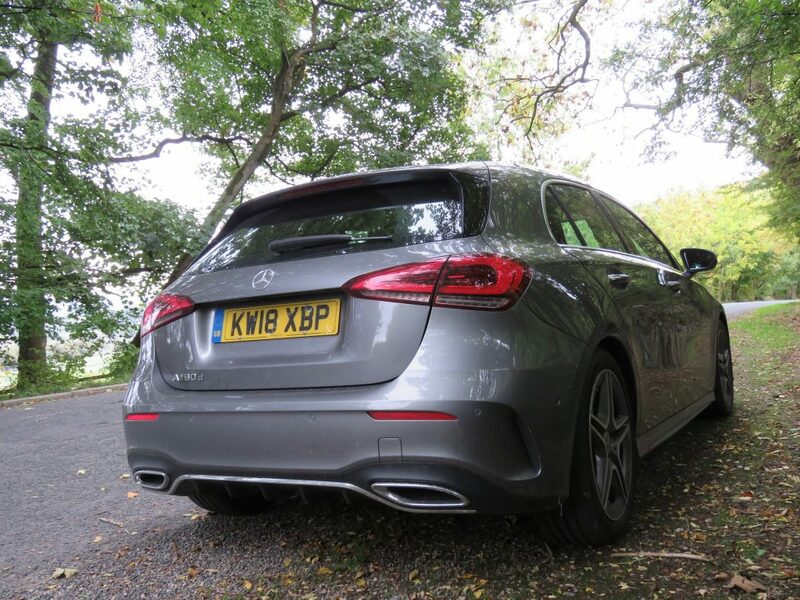 I also found the A-Class can be upset by some of the bigger pot-holes and while it’s certainly not a deal-breaker some of its rivals handle the lumps and bumps better. 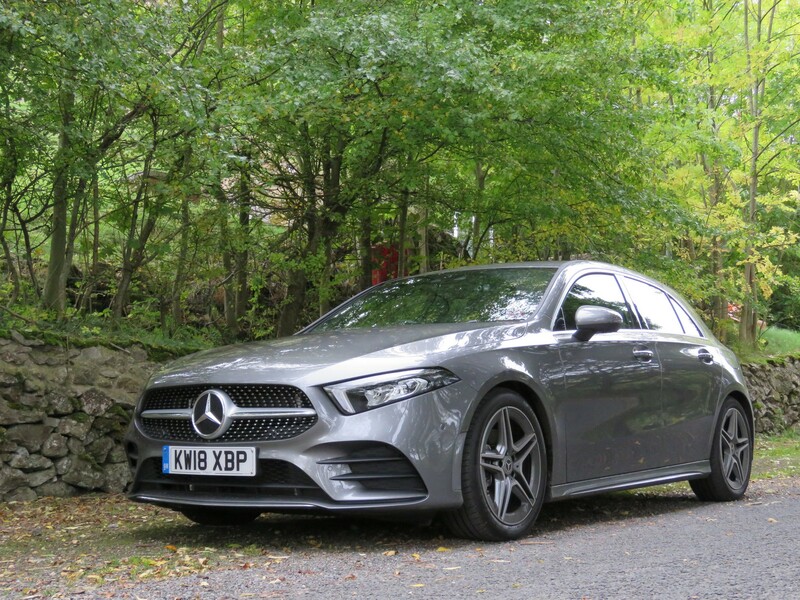 All-in-all the new Mercedes Benz A-Class is certainly a car to be considered when looking for a premium-class small hatch. The interior alone will sell it to many prospective buyers as it feels and looks very special and just can’t be matched by any of its rivals. 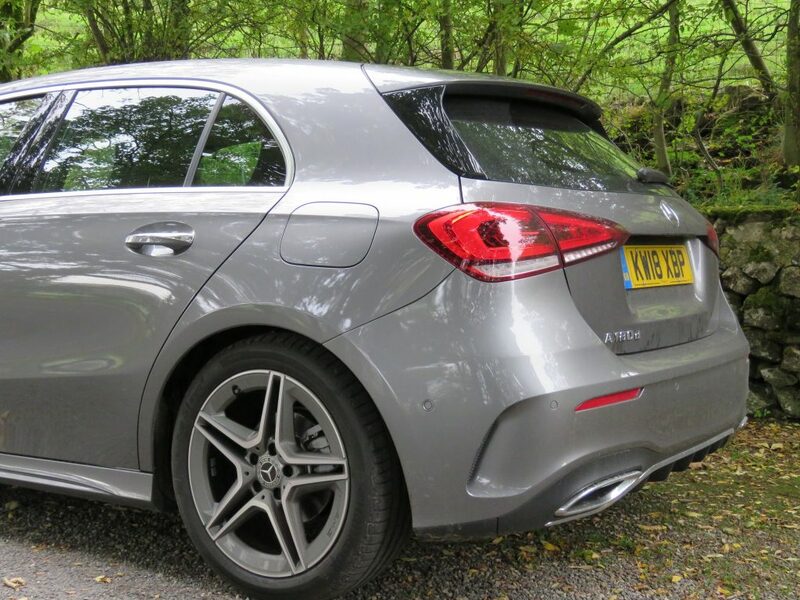 The A-Class feels like a “proper” Mercedes, at last.